Underlying the stability and safety of structures are the forces acting upon them throughout their lifecycle, including both static and dynamic loads. These forces can change over time due to exterior structural modifications, alterations to the building interior, or other external and environmental factors such as vibrations, infestations, fire, or water intrusion. Such deviations from original design assumptions can alter the balance of forces, compromising structural integrity and occupant safety. History is a powerful reminder of numerous failed structures. Examples include parking garages (Queens, NY), canopies (Hackensack, NJ), car ramps (Johnson City, NY), and sports stadiums (Heysel Stadium, Brussels, Belgium) [1-4]. Recently, an apartment balcony collapsed in Berkeley, CA, garnering global attention. Six students perished and seven were seriously injured. The cause: dry rot from water intrusion that weakened load-bearing joists—subsequently unable to support the expected design load . In an effort to improve structural resilience and safety, this application note explores an important component of building health and safety: structural crack monitoring. Ignoring or underestimating potential sources of structural instability is risky and can lead to partial or total structural failure. How does one determine whether a structure may be at an incipient or imminent stage of collapse? What are some techniques for analyzing whether changes are impacting the balance of forces acting on a structure? With static monitoring, the field technician or engineer periodically collects crack measurements on-site and analyzes trends. Each measurement is a "snapshot" in time, providing quantitative insight into differential movement that may affect structural integrity. This is the least expensive method of field deployment and testing, although data collection is more labor-intensive which factors into the total project cost. With dynamic monitoring, mechanical or electronic instrumentation continuously samples data, which can be retrieved locally, or remotely uploaded to a cloud datastore via WiFi or wireless cellular service. Instrumentation and associated software collect data in accordance with the engineering criteria established during the design and the installation phase. During the monitoring phase, the engineer may modify data collection parameters for better insights, including but not limited to collection frequency, sampling interval, sensor activation limits and alarms, resolution or range, or digital filtering to average out the effects of noisy signals and spurious data. Insufficient sampling may miss peak excursions important during forensic analysis. Conversely, excessive sampling can overwhelm the logger's local memory cache while reducing total sampling duration and/or battery life. Due to the requirements for power, network connectivity, and software services, dynamic monitoring is typically more costly and time-consuming to deploy, but can save downstream labor that would otherwise be necessary to locally retrieve data for later analysis. Figure 1. ANATOMY OF A CRACK. This photo illustrates a vertical crack approximately 1-3 mm wide, with larger areas of spalling. Epoxy injection can help to seal the crack from further erosion while impeding premature corrosion of reinforcing steel. Cracks typically originate from tensile (pulling) forces that overcome the tensile strength of materials under load, revealing patterns, inclinations and typologies that yield forensic clues to possible causes. While sometimes such determinations are clear and obvious, other times they are ambiguous. According to Zhao and Jiang  and further described in Ohtsu et al. , "K Ohno and M Ohtsu think the crack mode of cracking in concrete is normally changing from tensile mode to shear mode at impending failure." Thus, the presence of crack patterns (fissures spreading into a structure) may signal a reduction in localized or global safety margins. Without proper investigation and remediation, significant shear cracks could portend severe—if not near-term—structural failure, particularly if exposed to sudden live loads, such as vibration from nearby pile driving or seismic-induced ground acceleration. Figure 1 illustrates typical portions of a crack, which include the crack itself plus voids where spalling can occur. Visual analysis of crack patterns (including that in Figure 5) and their physical properties is an essential step to understanding the forces acting upon a structure. Gradual shifting of the structure adds risk for the balance of forces. An informed evaluation of crack progression over time helps to pinpoint compromised structural resilience—a precursor to ultimate structural instability and possible failure. While small surface cracks may be merely cosmetic (such as shallow shrinkage cracks in concrete or plaster), their existence can lead to moisture permeation, thus accelerating corrosion and potential failure of structural steel. However, the presence of multiple, more significant cracks often signifies deeper structural shifting. The crack patterns give forensic clues in relation to their shape, width, depth, direction and position—critical information on the nature and possible causes of structural movement. Outfitting the structure with permanent, accurate and smart monitoring facilitates construction-health assessments and mitigates situations that could deteriorate to structural failure. With visual inspection of the cracks, further data collection provides useful insight into the depth, extent, and physical properties of the crack. As Figures 2-4 show, small and portable hand-held surface microscopes aid in the forensic investigation and documentation process. USB microscopes are particularly handy, as engineers may capture multiple images at a high level of magnification while storing results on a computer or mobile device for later analysis and reporting. 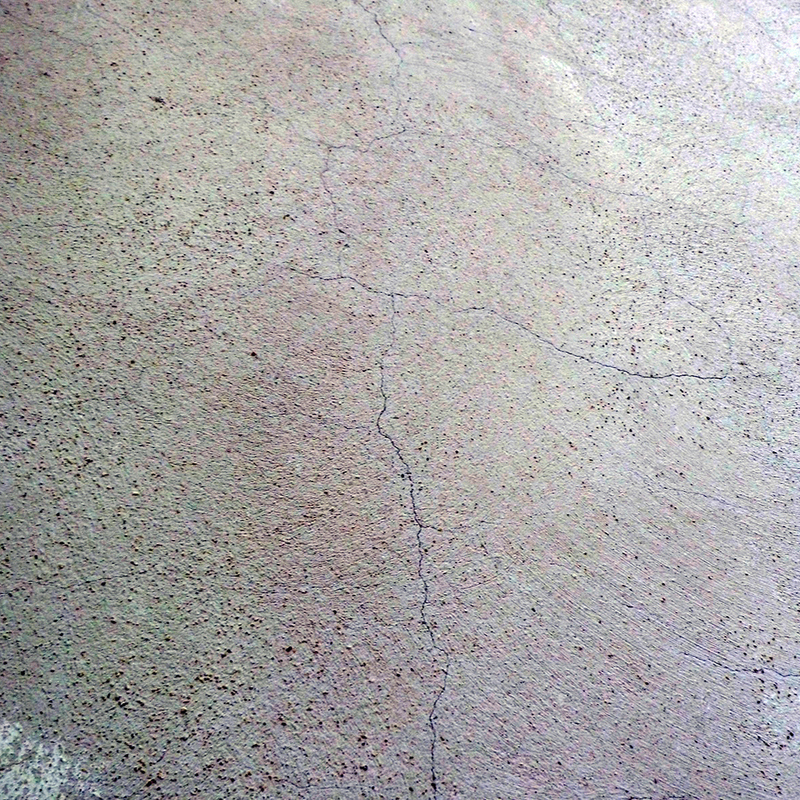 Reticular cracks in a more-or-less large mesh, in which crack vertices feed predominantly rectilinear branches, frequently indicate injury arising from contraction (plastic shrinkage) of plaster or surface coatings from improper curing. Microfiber reinforcement can help to mitigate this type of cracking. Figures 6-9 show typical crack progressions classified into four distinct evolutionary trends. Over its lifecycle, a crack may evolve through more than one phase, ultimately stabilizing in equilibrium, or accelerating toward catastrophic failure. Constant (Average): Manifestations of decay are uniform or cyclic within a well defined range. This can be indicative of expansive clayey soils that swell when moist and shrink when dry. Cracks often appear and disappear throughout the seasons as soil shrinks and swells beneath the foundation. Figure 6. Null evolutionary trend. Figure 7. 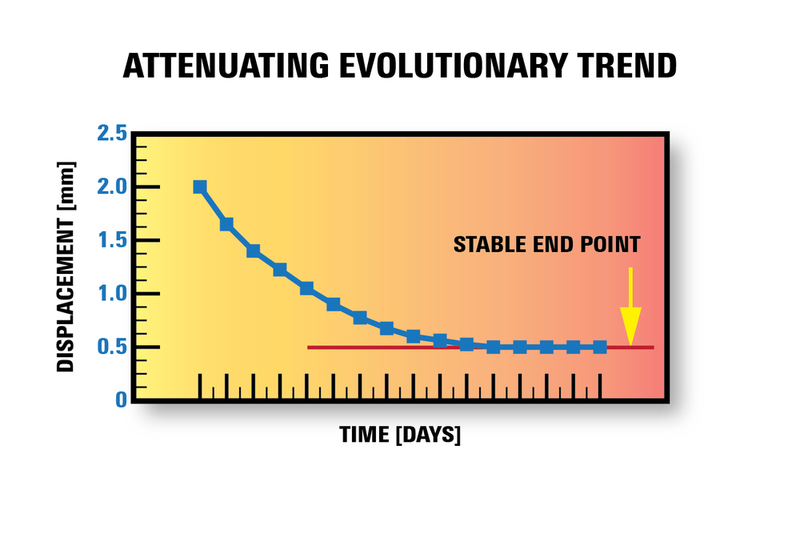 Attenuating evolutionary trend. Figure 8. Diverging evolutionary trend. Figure 9. Constant (average) evolutionary trend. Historically, whenever it was necessary to detect crack movement, engineers affixed small rectangular plates of thin glass across the crack of interest. The rupture or detachment of the slide indicated the presence of forces exerting on the structure, providing proof of structural shifting. However, this qualitative technique was uncertain and unreliable, and did not provide quantitative data to track the crack progression over time. Today, most engineers use various crack gauges, deformometers, and crack-motion recorders which, besides being cost effective and easy to install, provide more complete data samples to establish time-based trends, such as those outlined above. Figure 10. Professional crack gauge. 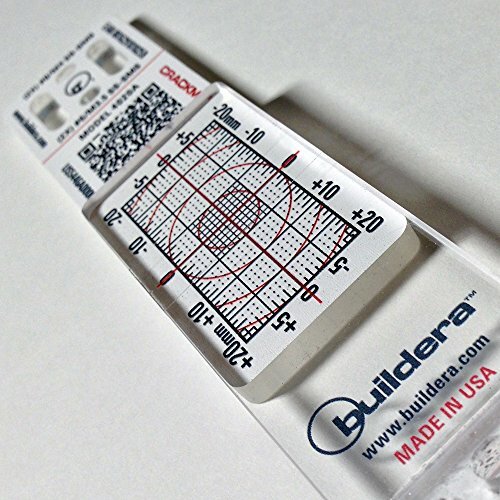 Buildera CRACKMON® 4020A Building Foundation crack monitor measures displacement over a total range of ±20 mm along the X-axis and ±10 mm on the Y-axis. A separate crack-magnitude scale measures the combined X-Y displacement vector. Crack gauges are affordable forensic instruments that measure the movement or displacement of cracks affecting orthogonal or oblique coplanar surfaces. As shown in Figure 10, they are manufactured as two overlapping thermoplastic plates (typically acrylic or polycarbonate), although stainless steel crack gauges that measure in three dimensions are also available [8-9]. The bottom plate includes a calibrated graticule in millimeters, while the top transparent plate has two orthogonal axes (X and Y). The extent of new crack movement manifests as a shift in X-Y position of the plates relative to each other, starting from the zero-zero reference value at the time of installation. Periodic monitoring and charting of measurements enable engineers to track and document movement of the crack over time, and to determine the most appropriate intervention method. Professional-grade crack monitors include heavy-duty construction, magnitude-measurement capability, and unique serial numbers for engineering traceability. Other models use a graduated angular scale to evaluate the extent of any rotation. Engineers document and track trends using preprinted crack progress charts or a field-proven approach using pocket-sized crack tracking cards and protective binder sleeves, such as the Buildera TRACARD® 3D crack documenting system. Installation is typically straightforward. In most cases, a two-part thixotropic (non-sagging) epoxy or structural adhesive is sufficient to affix the crack gauge across the crack, leaving each side of the gauge free to move with changes in crack motion. Some situations require mechanical fasteners—used in conjunction with adhesives—to provide a more tamper-resistant installation, particularly in higher traffic areas. The two overlapping plates, one with a millimeter grid, the other with a crosshair used as a point of reference, should align correctly during the adhesive-bonding phase, being careful to position the two plates on the zero-zero start position. This ensures that any future movement is relative to the initial starting point, which is also documented and recorded. Some models come pre-taped together, and others use two or four disposable pins to lock the 0-0 position during installation. 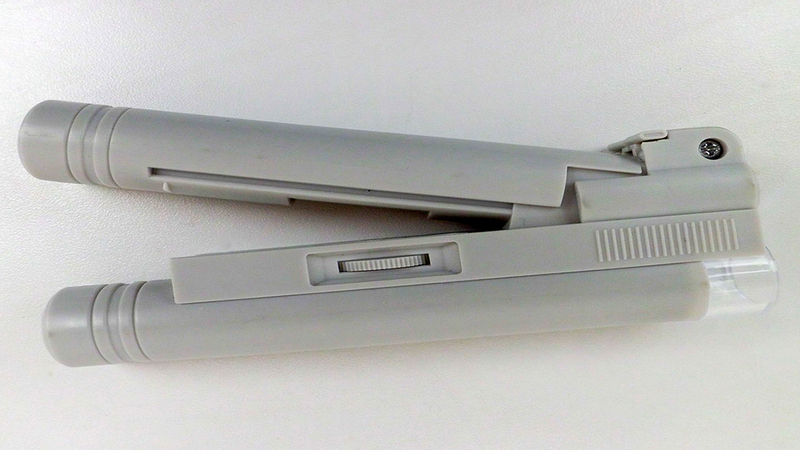 Once the device has cured, the installer slits the tape and/or removes the pins to allow free motion between the two plates. Crack gauges discern movement to ±0.5 mm (0.02") without a microscope or loupe. Certain versions, such as the CRACKMON® 5020AV, also integrate caliper standoffs to allow relative measurements to approximately 0.025 mm (0.001") resolution, depending on the accuracy of the digital calipers. As the engineer captures field data and plots it on a crack progress chart or TRACARD, the result is a permanent record of structural movement over time. The integrity of any structure relies on proper engineering and critical laws of physics that comprehend both static and dynamic loads, plus safety margin. However, structures may yield to changing forces throughout their lifecycle, including remodels, geotechnical factors, material decay, and external events such as nearby construction, earthquakes, floods, wind and snow. Structural crack monitoring is an important component of a holistic approach to building maintenance and safety. Using a combination of specialized crack visualization tools, including inspection microscopes and long-term crack monitoring, engineers are better equipped to detect early changes to structures that could lead to future failure. Matteo earned his B.Sc. in Civil Engineering and M.Sc. in Structural and Earthquake Engineering from the Università di Roma, Italy. He started his career as a structural and earthquake engineer, collaborating with various construction and engineering companies. Among his global credits include the design of buildings in Switzerland, structural health monitoring and retrofitting of bridges in China, dynamic and static tests of large viaducts in Algeria, and diagnostic and structural control of cable-stayed bridges and stadium in Italy. He also provided technical management and oversight in the design of steel bridges and other structures including skyscrapers in Switzerland, Italy, and the USA. Most recently, Matteo served as a steel-construction manager for the 92-story 30 Hudson Yards skyscraper project on Manhattan's West Side in New York City. He now serves as a project manager and structural consultant for the Italian company Progetto PSC. Matteo is a level-II structural inspector in accordance with UNI EN ISO 9712:2012 with the Bureau Veritas of Modena. He is an expert in diagnostic, NDT/NDE, structural monitoring, control and testing. Andrea is a certified technical expert in the civil and industrial engineering sectors. She earned both B.Sc. and M.Sc. degrees in Civil Engineering from the Università di Modena, Italy. During the first phase of her career, Andrea developed her skills as a structural designer with multiple engineering firms. Andrea subsequently specialized in non-descrutive testing (NDT), monitoring, structural diagnostics, control, safety assessments for both public and private sectors, including RINA (Registro Italiano Naval), and then with the Bureau Veritas. As a certified level-III structural inspector, Andrea organizes and trains level I and II NDT operators in accordance with UNI EN ISO 9712:2012. Andrea currently serves as the founder and CEO of the Italian company Progetto PSC. She is also the examination-center head and founder of the Bureau Veritas of Modena. © 2016 Buildera. All rights reserved. Please contact Buildera for written authorization to reproduce electronically or in print.